The 2015 MINI Cooper is now a "maxi": lots of fun, more doors, more options, and (potentially) more money. The 2015 MINI Cooper adds a 4-door variant for those looking for more doors, but not necessarily more functionality. The basic MINI formula is all there: smaller stature, quirky styling, and plenty of options to complement the athletic chassis that's just so much fun to drive. If you can limit yourself to certain options, you can make a MINI affordable and fun—a rare combo in the small-car segment. It’s easy to get caught up in the quirky styling of the 2015 MINI Cooper and overlook the small, athletic, and capable frame that helped it survive the retro fad from which it was (re)born. The 2- or 4-door Cooper hatchback (MINI calls them 3- and 5-door versions, respectively) is small compared to everything else on the road, but a far cry from the diminutive British Motoring Company boxes of yesteryear. Those cars are roughly 33 percent smaller than the MINI Coopers on the road today, and it’s logical that the brand would grow further—literally and figuratively. 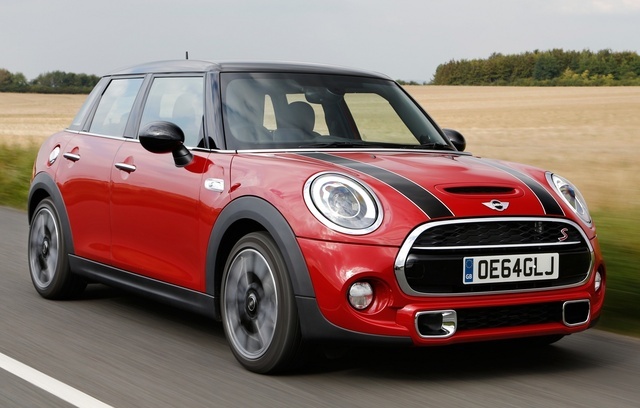 New for 2015, the MINI Cooper is available with 2 additional doors. 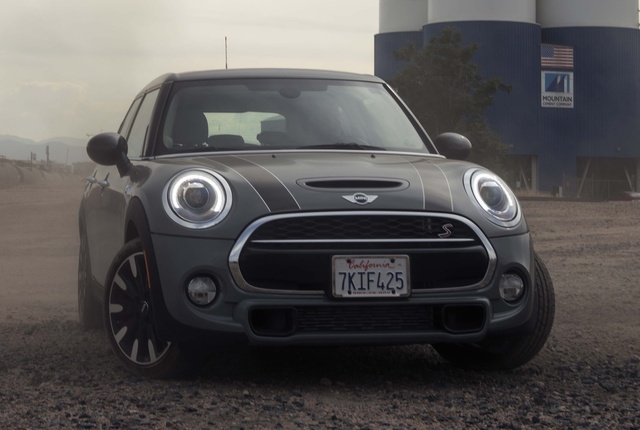 The range still starts with the Base Cooper, which sports an inline 3-cylinder engine; a Cooper S, which offers a boosted 2.0-liter 4-cylinder; or a top-of-the-line John Cooper Works sport model that force-feeds its busy four even more. The 2-door versions can shed their hardtop roofs in favor of folding soft-tops and can be spec’d from Base to JCW. The 4-door models are sold only as hardtops. The 4-door Cooper Hardtop’s lineage is more closely aligned with the longer Clubman rather than the shorter 2-door. The 4-door Cooper Hardtop is 6 inches longer than the 2-door Cooper Hardtop, and the 4-door’s wheelbase has been extended by 3 inches as well. As you might expect with any MINI, options abound. The car can be configured in myriad ways, including paint schemes and seating surfaces. Buyers will likely need to decide on their transmission first: The Cooper and Cooper S can both be fitted with a 6-speed automatic or 6-speed manual. 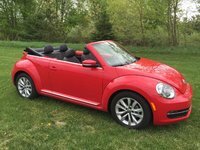 From there, the list of options is infinitely customizable like something from a hot-dog stand: Cold Weather, Sport, Wired, Fully Loaded, Premium, and Media packages await shoppers and quickly add to the $20,700 base price for a Hardtop 2-Door or $21,700 Hardtop 4-Door. Predictably, as a BMW sub-brand, the MINI gets expensive in a hurry—a fully loaded 4-door MINI can cost more than $40,000. MINI trades heavily on its performance capability, but emphasizes its “fun factor” over strict empirical data. The smaller of the two powerplants, the turbocharged, 1.5-liter inline 3-cylinder, makes only 134 hp and 169 lb-ft of torque, which is good for a 7.6-second run up to 60 mph. In exchange for blinding speed, the small 3-pot returns 28 mpg city/37 highway/34 combined. The Cooper S boasts a 2.0-liter turbocharged 4-cylinder that adds 55 more horses to the front wheels for a total output of 189 hp. Its 207 lb-ft of twist is the more impressive figure and helps the car reach 60 mph more than 1 full second faster. The price you pay is in fuel economy: The Cooper S is rated at 24/34/27 mpg. But speed in the Cooper S is relative; although it isn’t the fastest hatchback in its class, its low seating position and direct steering make it the most engaging. The JCW shares the force-fed four from the Cooper S, but turns up the boost all the way to 228 hp and 236 lb-ft of torque. That’s good for a sub-6-second sprint to 60 mph, but you may trade functionality and comfort for performance. Regardless of spec, the MINI is one of the most direct and competent small cars on the market today. The automaker proudly invites comparisons with go-karts, and that’s not far off: The MINI Cooper darts around cities like it was built at an amusement park. 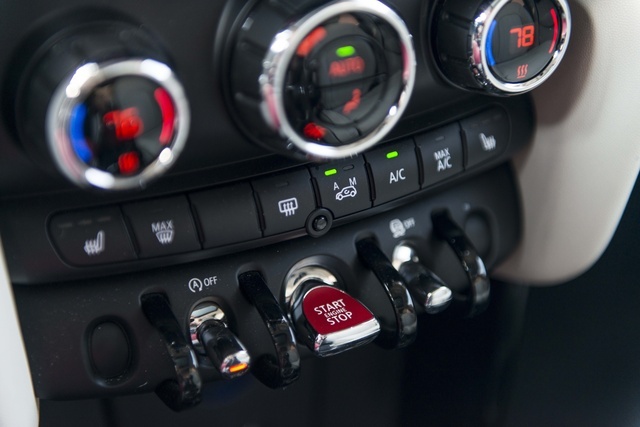 Standard on all MINIs now is an ECU management system to coax the MINI from “Green” eco driving to “Sport” throttle response via a collar around the transmission. Disc brakes at all four corners arrest your fun at the stoplight while you await the next green. Our Cooper S tester’s engine wasn’t the quickest to rev, but it was the most satisfying when the boost kicked in and it was kept between 3,000 and 4,500 rpm. Be aware before you wring out every last rev in the range: It doesn’t feel like there’s much more power from 5,500 to 6,000 rpm. It’s cliché to say that the manual is always more fun, but in the 2015 MINI Cooper S the maxim holds: You’ll be rewarded for rowing your own gears. The light clutch is easy to use in traffic, and the superb 6-speed is tight and precise. If you insist on an automatic transmission, which is $1,500 more, you’ll get paddle shifters but fewer cogs than BMW could have included. 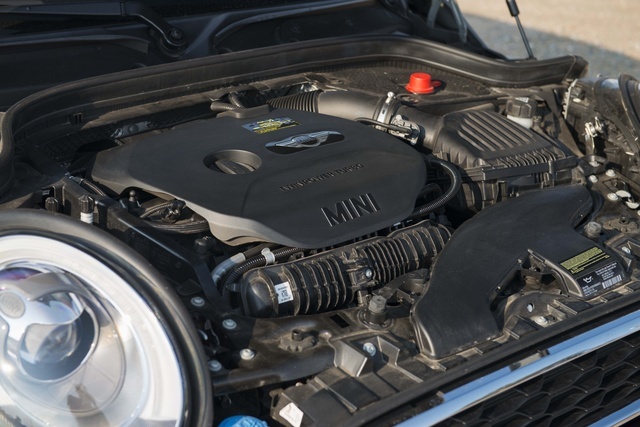 The BMW cars with which the MINI Cooper shares a platform get 8-speed automatics, and it’s unclear why BMW omitted those transmissions in the Cooper. For such a small bulldog, the MINI Cooper S is surprisingly quiet. Unsurprisingly, the MINI Cooper comes with a very good stereo upgrade (befitting a “premium” car) and lots of fun tech features. For 2014—and continuing for 2015—MINI turned down the quirkiness just a little to make the Cooper a little more accessible. The switches to roll down the windows have now been placed on their doors (they were previously mounted in the center cluster), the speedo and tach are now in front of the driver, and the mid-mounted, multi-function saucer is slightly more user-friendly. I didn’t bury the lead: The functionality of the 4-door MINI Cooper falls behind the rest of its interior perks. In reality, the rear seats are just as usable as the 2-door’s seats, and the rear doors drape so far over the rear wheels that it’s worth wondering aloud when exactly they were added. 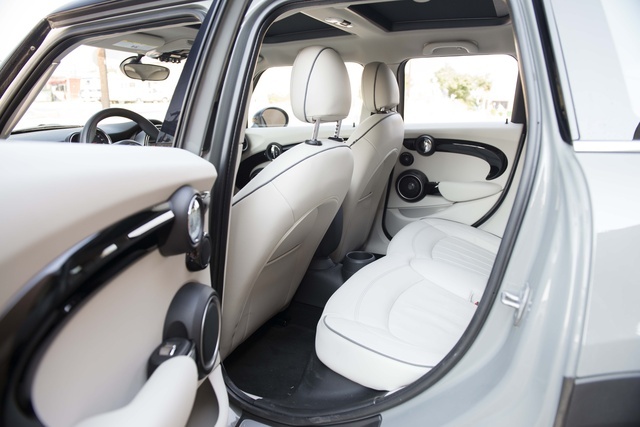 For children and small adults, the rear seats may be more of a convenience, and the 4 doors could be necessary in some instances, but any hope of a “practical” 4-door MINI Cooper should be dashed—there are better tools for that job. The MINI Cooper is equally at home on long and short trips, which is surprising considering the Cooper’s fondness for ripping around city corners. In reality, its road manners are very refined and comfortable, befitting a car that would cost much more. The MINI Cooper can’t overcome all feats of physics. Although the Cooper 4-Door wears its extended length well, it’s not as friendly around corners as the 2-Door, and its heavy engine lump up front can coax the Cooper into understeer if you’re grabbing it by the scruff. Lay off the throttle, dab the brakes, and twist the wheel a little more, and you’ll be rewarded with a sorted, sporty car that’s fun to drive. MINI makes hay by building compact cars compactly. 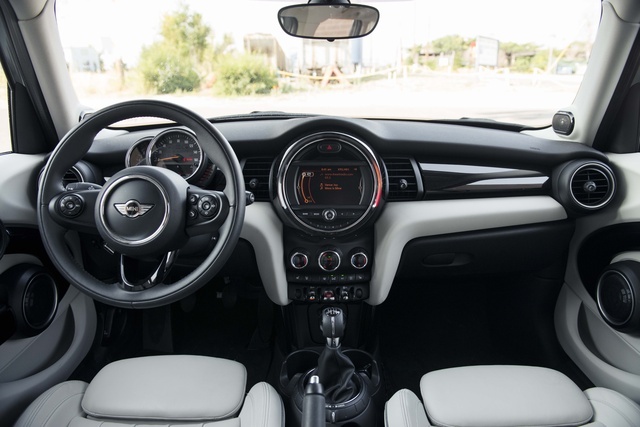 What that means is that MINI’s Cooper has a compact layout, with compact controls, in compact spaces—not a shared layout and controls shrunken down with still-too-big buttons. Everything in a MINI seems like it should be where it is. Long story longer: The MINI Cooper’s ergonomics are thoughtful and precise. Consider the following: Instead of a dash-mounted Sport button, where space is at a premium, the button is a collar around the transmission instead, a slider to select between Green, Normal, and Sport modes. The hub of the MINI Cooper’s tech is its center-mounted infotainment disk, complete with mood ring. In the past, the Cooper’s speedometer and tachometer were mounted here, but those have since migrated to in front of the driver. What’s left is a clean, uncluttered layout that can either display MINI’s base radio, a 6.5- or 8.8-inch LCD display with climate, entertainment, and information about the car, including adaptive suspension and messages. The controller for the MINI’s system is a mixed bag; although the controller’s layout is straightforward, it’s fairly hidden and disconnected from the overall system. The Cooper can be configured with cloth, leatherette, or leather seating, including heated seats up front. The interior is designed with style in mind, but that’s not to say it isn’t functional. The bright red Start/Stop switch invites attention, but is shaped differently than the rest, so you don’t have to look for it every time you need to start the car. The words “storage” and “MINI” sound like they’d be mutually exclusive, and it’s not far off. The MINI 4-Door’s 13.1 cubic feet of storage with the seats up and 40.7 cubic feet of storage with the seats down won’t satisfy the fire department on a grocery-store run, but it’s enough for most city errands. For 2015, MINI offered a $250 factory-installed roof-rack option that should live on beyond this year. 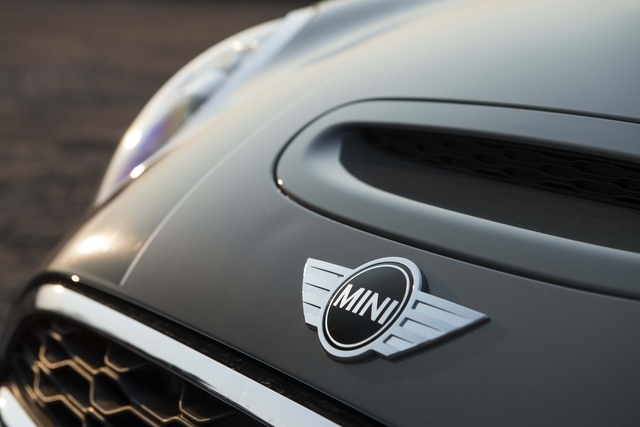 For 2015, MINI offers rear parking sonar and an automated parking assistant for its cars that helps drivers park their (admittedly) small cars. The National Highway Traffic Safety Administration hasn’t rated the MINI Cooper for safety, however the Insurance Institute for Highway Safety bestowed its highest, Good rating for the MINI Cooper’s crashworthiness, including the notoriously difficult small overlap crash test. 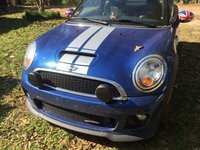 The MINI Cooper has standard safety equipment such as antilock brakes, driver and passenger airbags, knee and side curtain airbags, and traction control. The MINI Cooper possesses a quality BMWs have had for a while: the ability to get expensive in a hurry. Our 4-Door tester topped out beyond $34,000 without every option ticked, which makes a compact MINI a tough pill to swallow for entry-level buyers. However, the MINI Cooper’s $20,700 base price ($21,700 for base Cooper 4-Door) is a tempting proposition for the patient buyer who can spot his or her car in the exact configuration they want. Saving the automatic transmission ($1,500) can offset the must-have premium sound system ($750) and so on. At $3,400 more, the Cooper S stands as one of the most exciting compact cars on the road today. Forced into early retirement before his 1988 debut bout against "Million Dollar Man" Ted DiBiase for the Intercontinental Championship belt, Aaron is a syndicated automotive columnist in newspapers spanning the Louisiana and Gadsden purchases and the Northwest Territories. When he's not writing about cars, he's driving them. And when he's not driving them, he's probably eating or sleeping because you need to do that too. What's your take on the 2015 MINI Cooper? Users ranked 2015 MINI Cooper against other cars which they drove/owned. Each ranking was based on 9 categories. Here is the summary of top rankings. 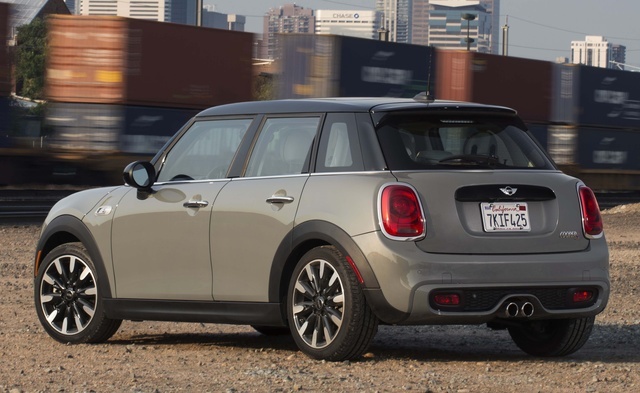 Have you driven a 2015 MINI Cooper? Shouldn't Using The Clutch To Down Shift Disengage Cruise Control? Is there a way to add the value of remaining manufacturer's warranty to the IMV? My car was purchased late in the model year and has low miles, so much better than average warranty remaining.